I’ve found something extremely weird to share with you today — sculptures that aren’t really sculptures…because they don’t stand still. 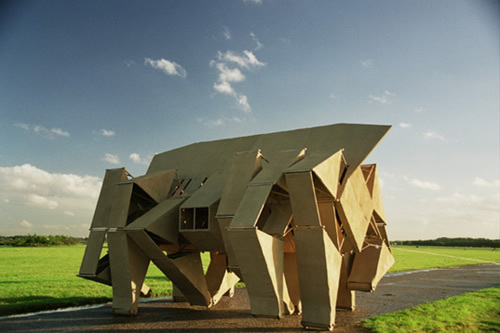 Instead, Dutch artist Theo Jansen has created sculptures that actually move with the power of the wind. He calls his creations ‘strandbeest’ or beach animals. They act like a new kind of species he developed on his own through the power of art, physics, engineering, and creativity. At this point, they are mostly powered by wind. The fact that they actually store that power for future use is a green idea that our society has started to tap into more recently. Jansen, who is a former physicist, has held nothing back in making his art. In fact, his work might lead us to believe that going mobile with the power of wind has some validity to it. The strandbeest has already been featured at several festivals, including Burning Man, an art and expression festival in the Nevada Desert.